The Remove Transparency effect negates transparent values in an image. 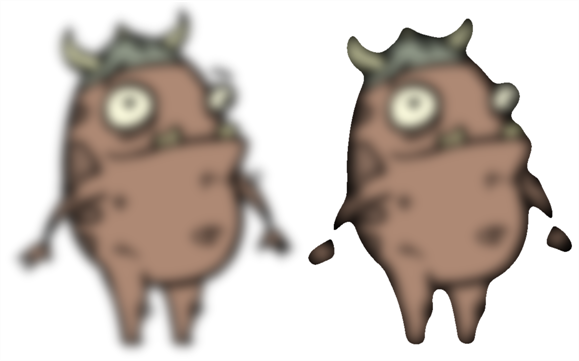 You can use the Remove Transparency module to remove the result of antialiasing around an image. 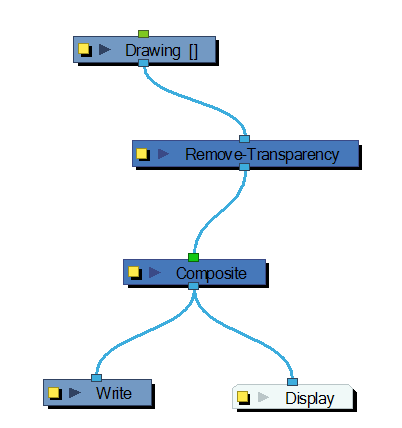 Use the Remove Transparency editor to control the effects of the module. • Threshold: All values above the Threshold represent a transparent value. In this field, you must identify the value above which all alpha values are considered transparent. Alpha is measured from 0 to 255. • Remove Colour Transparency: When selected, the Threshold value is used to determine which pixels in the Colour-Art (RGB channels) to make fully opaque or fully transparent. 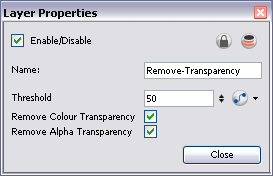 • Remove Alpha Transparency: When selected, the Threshold value is used to determine which pixels in the alpha channel to make fully opaque or fully transparent.